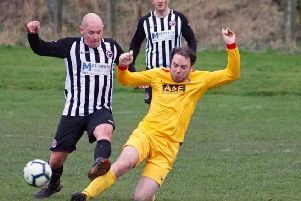 A hat-trick from in form striker Phil Airey, and a string of fine saves from Callum Brooks ensured Alnwick Town secured three points in a hard fought contest at St James’ Park. 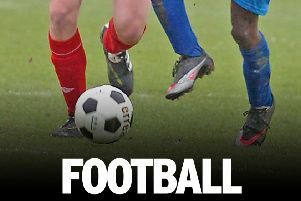 They say the league table doesn’t lie, but Gateshead Reserves gave Alnwick Town an almighty scare at St James’ Park, with their performance not reflecting their current position in the Northern Alliance. Ross Moore returned to the starting 11, along with Kyle Burns taking a place on the bench following long term injuries received away at Bedlington Terriers in the Senior Cup. New signing Tyler Scarth started from the bench. Alnwick had the opening chances on the game, the first being from Airey, who following a cross from Eastlake saw his header tipped over the bar by Ugochukwu in the Gateshead goal. With seven minutes on the clock the opening goal arrived, with Airey not to be denied this time. The striker fired a half volley from inside the box low under the goalkeeper to give the home side the lead. Jonny Colley almost made it two following an Airey flick on, but his chance was saved. Gateshead began to come more into the game, and were looking for through balls for their pacey centre forwards. In the 23rd minute, it paid off as good build up play found McGeoch who fired left footed into the corner of the net from 15 yards out. McGeoch, who recently made his debut for Gateshead’s first team, almost gave the visitors the lead, but found Brooks in fine form to deny him. The final chance of the half fell to Quinn, but following quick build up play his effort was comfortably saved. The second half saw Dundas replaced by Drummond due to a thigh injury, and this was shortly followed by Colley going off for Scarth due to an ankle injury. In the 52nd minute Alnwick were back in front. A break down the right saw Douglas get to the byline and whip in a cross that was perfectly placed for Airey to power home with his head. Almost immediately after the restart Gateshead should have been level, but after the ball came along the six yard box, Dingley could only send the ball straight across the face of goal, somehow failing to score. After 62 minutes Gateshead were back level once again. A pre-planned corner routine was drilled low to the edge of the box, dummied by one player, with McGeoch waiting to smash the ball through the crowd of players into the net. Brooks then produced two fine saves to deny substitute Warriner and once again McGeoch as Gateshead pushed for a winner. The game was end to end and the big moment came in the 88th minute. A short back pass allowed Airey a chance, and as he nudged the ball past the keeper he was brought down in the box. Airey stepped up and sent the keeper the wrong way from the spot to complete his hat-trick. The drama wasn’t quite over yet, as Gateshead once again had the ball in the back of the net in injury time, but the goal was ruled out for handball.